Mountain Views await at Whitetail Retreat. 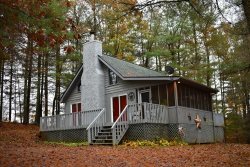 This cabin is less than 15 minutes from both Blue Ridge and Ellijay, GA. It offers all the amenities of home, stunning furnishings and decor while you still enjoy a true cabin experience! Take in nature as you travel to your cabin rental in the North Georgia Mountains. You will enjoy the peace and quiet that awaits you. Walk into this beautifully decorated 2 bedroom 2 bath home and you’ll immediately feel relaxed. The kitchen is fully equipped ready for a romantic or family meal. The living room has a large sectional sofa, stone, gas log fireplace and flat screen TV. Step outside onto the large covered porch and open air deck, large enough for a yoga class for at least four with a view so bring your mats yogis! There is also a gas grill for and plenty of seating. Both bedrooms in the home have queen beds with exquisite decor. The master has an ensuite bathroom with shower. The second bedroom has access to the main level bath with a shower tub combo. Don’t worry you won’t miss any of the luxuries of home as the cabin has free WiFi, Cable TV, dishwasher and washer dryer. The cabin is Non-Smoking and pet friendly so bring your sweet fur baby (dogs under 25lbs) and come on up! Don’t miss out on the many unique activities and outdoor experiences North Georgia has to offer. Meander the streets of Blue Ridge or Ellijay, GA where you will find one of a kind shops, breweries, vinyards and eateries. Take a ride on the Blue Ridge Scenic Railroad, Hike the Appalachian Trail, Visit a waterfall or swinging bridge, Tube, Kayak, Paddle Board or White Water Raft the Toccoa or Ocoee River’s. Go boating on Lake Blue Ridge or step back in time and watch a first run movie at the famous Swan Drive-In Theater. And of course Mercier Orchards is a must. There is always a festival or event happening here in the mountains. "We had a wonderful experience, as we always have with Mountain Laurel. Our cabin was impeccably clean & exquisitely decorated. Having 2 bedrooms and bathrooms all at the same level was very convenient. We stayed at Whitetail Retreat Cabin. What made the experience outstanding is that I left behind my favorite jacket. I called to report it, and the following day Vivian Gayton returned my call saying that she found it, and would ship it immediately. I understand that this was an inconvenience, but Vivian was pleasant as if it wasn't a bother at all. She was sweet and caring. I received it the following day. I would definitely HIGHLY recommend using Mountain Laurel Cabin Rentals for a vacation getaway." Super clean. Great size for two people and great location. The deck is also huge with a great view. Would stay again.